You are here: Home / Creativity / The Revolution! In August, analysts at Morgan Stanley using data from an Oxford University study predicted that nearly half of U.S. jobs will be replaced by robots over the next two decades. It’s said we will have cars that drive themselves, waiters we won’t need to pay and personalized butlers. Looks like we’re moving rapidly toward a future without actual jobs. According to a 2013 Stanford University study, some manufacturing robots now cost the equivalent of about $4 per hour – and they keep getting cheaper and better. We even have robots that think. Editors at the Associated Press claim robots write thousands of articles a year for them. It would seem as if the dream of living a WALL-E-type existence, where we float around in auto-piloted chairs, sip on a liquid turkey dinner and stay glued to the attached monitors may become a reality. Not So Fast! While it certainly seems like we’re headed toward a scary and confusing robot revolution, it is best to remember that technology always creates more jobs than it destroys. Progress creates angst, but it’s still progress. And this time will be no different. Consider that computers destroyed a great deal of manufacturing jobs, but enabled hundreds of millions of new jobs. The reality is that technology augments humans, rather than replaces them. We don’t need to fear the robots, but we do need to understand that the jobs robots can replace aren’t good jobs in the first place. As humans, we climb the ladder of success using our brains. So we must tap into the greatest computer inside of us, embrace a strategic mindset and start anticipating the kinds of jobs that will emerge over the next 20 years. Leadership is not about getting people to work harder. In fact, it’s about discovering new paths and new ideas, and incubating the skills needed to sustain us in the future. Leadership is about identifying markets that are important and providing that community a competitive advantage. The future is bright, and while we can all concern ourselves with the changing job climate, take solace in the fact that history proves progress is good. This month’s Connect Magazine has a cover story titled “The Great Escape.” We discuss some of the strategies and marketing ideas that will gain momentum next year an over the next several years. A second article speaks to how your employees are your best branding asset. Both are compelling articles that remind us where our focus should remain. 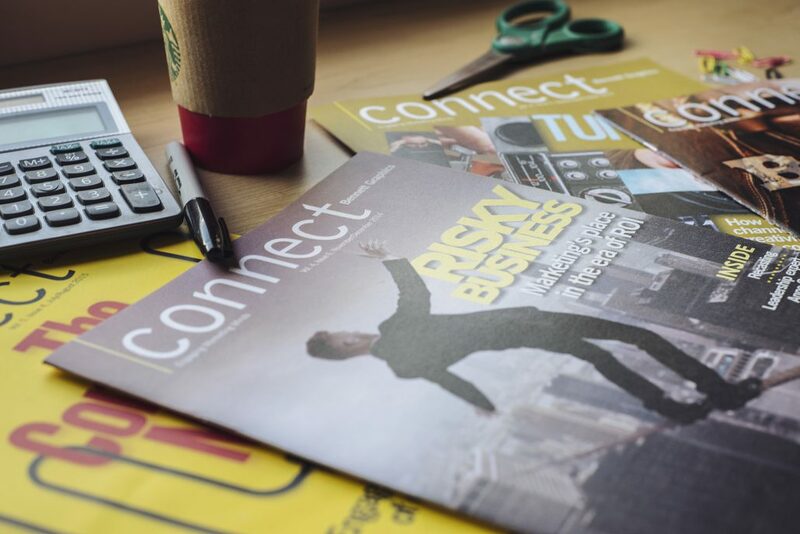 If you would like to receive a copy of Connect Magazine please let us know. You can subscribe on our website and it’s completely free. http://www.bennettgraphics.com/bennettgraphicswordpress/wp-content/uploads/2016/11/connect1.jpg 4016 6016 David Bennett http://www.bennettgraphics.com/bennettgraphicswordpress/wp-content/uploads/2015/07/bennett-graphic-logo.png David Bennett2016-11-28 21:20:332016-11-28 21:45:37The Revolution! What If…we just asked our client? Embrace the Negative.